Steve's Author Bio: Steve bought an iPhone in 2009 with no idea what it could do to him. Now he is into the world of mobile applications, specializing in iPhone app reviews. He scours the App Store several times a day to find the very best iPhone applications. Are you looking for work? Do you enjoy social networking and find that you sell yourself best when you talk rather than write? Then Hirred is for you. Wiink Inc. has come up with a this social networking app aimed at bringing employers and candidates together through short 30-second video clips. You are probably wondering how that works. Imagine just listening to a short description of a quick task that needs completing. You don’t have to read anything, you just watch and listen. You become interested. So, you reply, or apply, with a short video clip about why you are the best candidate to get the job done. Flip it around, now. You are looking to have a small app for iPhone written, or need a few short blog articles for your new website. Come to Hirred and make a quality 30-second infomercial about the great task you have at hand, and watch as the replies post to your clip, with offers of talent that knows no bounds. Hirred works well for those in an industry where creativity abounds. People who just can’t describe in words how great their talent is, can do great justice in 30 seconds by saying a few words, giving the right facial expressions, and making contact; because, at the end of the day, it’s the contact and familiarity that gets you the job. For employers, this means striking the right chords with potential hires with a description of your needs and what needs to be accomplished. Sometimes, words alone do no justice. It takes a bit of moving art to make something come to life; and, in 30 seconds, enough can come to life. When you first download the app, you will have a chance to setup your profile. From the main page, you can view Pitches or Calls. Pitches are clips about people and their talents. Calls are clips about jobs. Under each category of viewing you can select the level of video clips: Rising or Live. Rising is essentially “just starting out”, while “Live” is a user that has been using Hirred for a while, and may have had a few jobs or even hired a few folks. 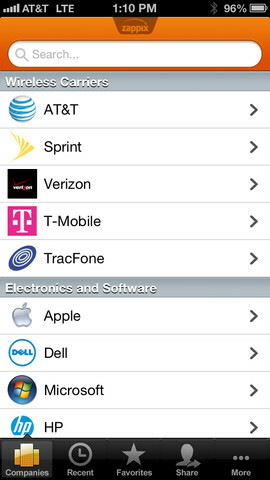 Use of the app is fairly simple, as all you are doing is recording yourself in response to a Call, or creating a Call. Logistics behind the app reside in the Main Menu, which sits at the bottom of the screen. The menu fades away to a small blue domelike icon when minimized. This renders greater screen viewing real estate. It does get a bit awkward when trying to conjure up the main menu, as many times I found myself pulling up the iPhone’s menu instead. This should be changed. Other than that, Hirred has some potential. It may not do too well on just the merits of 30-second video clips. Descriptions that short serve as attention getters and teasers… to attract interest. 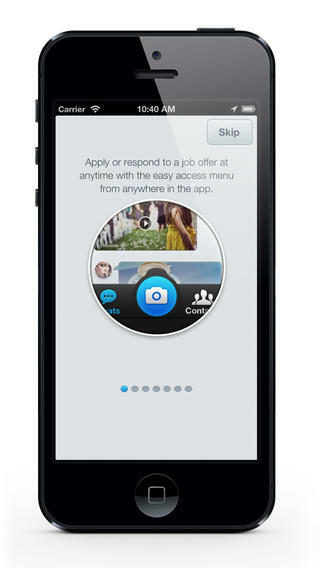 This app will do well if it adds the ability to link clips to resumes or websites that offer more details. 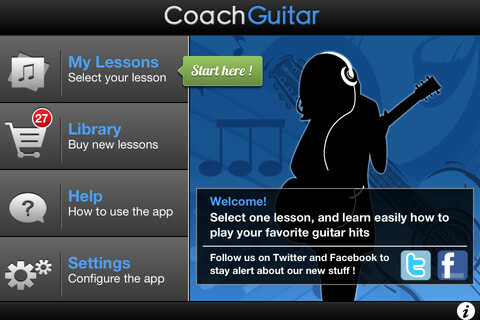 Coach Guitar enables users to learn guitar without any music theory or tablature. The animated black fret-board represents a guitar and the fingers are marked with different colors to specify the positions efficiently for both hands use. The colored dots signify the different chords of an acoustic guitar to be strummed. These instructions are available in Help menu on the start screen. When you open this app, the page shows options such as My Lessons, Library, Help and finally Settings. After going through the Help option, you need to start with My Lessons where there are few popular songs pre-loaded. Then, you have to choose one among them and proceed for the coaching sequences. Just like a true professional, this app provides a step by step teaching facility which helps the users to play each verse of the song with perfection. This version also contains two amazing songs for free- Stairway to Heaven by Led Zeppelin and secondly, Wake me up when September ends by Green Day. Another interesting aspect of this app is the availability of video lessons in HD. You can watch and learn in no time. In the Library, you can buy and store your favorite tracks available which you want to learn. The Library is updated quite frequently for the convenience of users. Also, the developers have provided the settings option to configure this app as per your wish. The appearance of Library is quite similar to that of a normal playlist in your phone only with a single modification of the price tag on the extreme right of the songs. This can be considered one of the flaws of this virtual guitar teaching concept. You have to pay a certain amount for adding up your favorite tracks further. The customers have complained about this attribute and rightfully so. Looking at all the pros and cons of this guitar teaching app, I am pretty much satisfied by its functioning. This app skillfully acknowledges its name and acquires relevant features to teach users how to play a guitar. Coach Guitar version 1.7.3 requires only 13.2 MB of phone memory. With the presence of a large display screen in iPhone and iPads, the working of Coach Guitar becomes easier. There are apps that do just about anything these days, including starting your car for you. And while you are waiting for your car to start up, why not make that annoying phone call to the cable company about your monthly bill? If you answered, “Because I don’t want to wait on hold forever,” Zappix could be your one app for your customer service needs. This app provides the user with a simple way to maneuvering through irritating automated customer service wait times. The simplicity of this free app arises in the very beginning when the user signs into the app. After entering the straightforward information one can access a large number of major companies, non profits, and government agencies, with new ones to come all the time. So whether or not it is the cable company or the court house the user needs to call, Zappix has you covered. If the company the user is trying to get a hold of and is backed by Zappix then the appropriate menu appears for the user to significantly cut back on the wait time. Zappix uses a visual means that even the not so savvy smart phone user would understand. You can connect it with all the popular social media such as Twitter and Facebook, which in the end connects you to the companies Twitter and Facebook pages; making it that much easier for you to get a hold of someone. A user can also find the customer support email, and write to the company if the issue calls for more than a minimum number of characters. Everyone has those days where it seems that everything is happening at once. Bills need to be paid, kids need to be picked up, soccer practice and ballet lesions after dinner all come with one thing consumers want more of – time. With the direct links to mobile websites and information pages Zappix takes out the need to Google the information and jot down the phone numbers which the user then needs to find time call. And to make it that much quicker the app uses stores the “Recent” contacts and “favorites” the contacts that the user specifies. Since there is nothing perfect in life, though this app may seem to the user like the closest thing, Zappix also has its downside. Because the app is so new the number of companies does have an ending point. Though more and more companies are being added to the list daily, some users find that not every company specific to their needs can be found by searching the company name.